Titanium, stainless steel and other corrosion-resistant materials are used for tubing and pipework, especially when highly corrosive materials flow through them. When such pipework is welded for joining or repairs, it is necessary to protect the material in and close to the weld joint, carried out by a technique called weld purging. Oxygen and nitrogen can be harmful to the weld joint in particular as they will combine very easily with the hot material, forming oxides and nitrides, until the temperature falls below its oxidation point. One inexpensive accessory called a Weld Trailing Shield® can be added to a gas tungsten arc welding/tungsten inert gas (GTAW/TIG) welding torch before beginning a pipe weld. This lightweight tool, designed and manufactured from Huntingdon Fusion Techniques (HFT®), is easily manoeuvred around the pipe joint as it is being welded, with no inconvenience to the welder. The Trailing Shield is connected to an argon gas source and when the weld is started, it has extra argon flooding to the sides of the weld, covering the heat affected zone that is adjacent to the weld. As the welding torch moves forward, because of the length of the Trailing Shield, the weld remains under an argon gas shield until the welded metal has cooled below its oxidation temperature. With automatic welding machines it is possible to raise the welding speed dramatically and enjoy the major benefits of automatic welding. Each Trailing Shield is delivered with a variable diameter connector so that it can fit any size of TIG/GTAW/plasma arc welding torch for manual or mechanised welding. Savings on expensive cleaning and pickling costs to remove oxidation and discolouration on these corrosion-resistant materials pay for these shields in the first weld and the shields can be used for years without replacement. Trailing Shields are available immediately for any diameter of tube and pipe of 17 mm upwards. 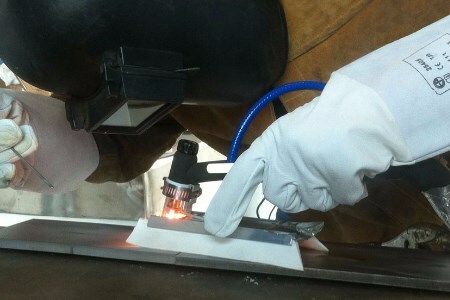 They are also manufactured in flat format for sheet metal welding.